Jim Horn at School Matters is so right on in this piece that I couldn't pick and choose some excerpts. So here it is intact. [Give Jim a spin on a regular basis.] Note the mention of former Daily News ed reporter Joe Williams, who has found a way to profit on the backs of poor children and may now officially join Eva Moskowitz as an official poverty pimp. "Sharpton was a pretty big draw," says Washington schools chancellor Michelle Rhee, recalling the boisterous crowd at Cardozo. Rhee is known for shutting down schools and aggressively pursuing a private sector-financed merit pay program. Some of the locals who came out to hear Sharpton booed Rhee's speech at the same event, despite the fact that her policies embody the movement for which Sharpton speaks. If one person is at the center of this close-knit nexus of Wall Street and education reform interests, it is Joe Williams, who serves as president and treasurer of the EEP's board and is also the executive director of Education Reform Now. But it is through his day job that Williams, a former education reporter for the Daily News, exerts the most influence. He is executive director of Democrats for Education Reform (DFER), a four-year-old PAC that has gained considerable influence, raising $2 million in 2008 and demonstrating remarkable public relations savvy. During the Democratic Party's national convention in Denver this past August, DFER hosted a well-attended event at the Denver Museum of Art, during which Fenty, Booker, Klein, Sharpton and other well-known Democrats openly denigrated teachers unions, whose members accounted for 10 percent of DNCC delegates. With Clyburn and other veteran members of Congress in attendance, many longtime observers of Democratic politics believed the event represented a sea change in the party's education platform, the arrival of a new generation. While progressive groups such as Education Sector, Education Trust and the Citizens' Commission on Civil Rights have long attempted to push free-market education reforms to the Democratic Party, it is only with the arrival of DFER that the movement has had a lobbying arm with an explicit focus on influencing the political process through fundraising and media outreach. "For a lot of groups that are dependent upon both private money and government money, there's a tendency not to want to get involved in the nitty-gritty of politics," Williams said in a March 31 phone interview from Denver, where he was meeting with Colorado politicians, setting the stage for DFER's expansion there. "Our group--what we do is politics. We make it clear: we're not an education reform group. We're a political reform group that focuses on education reform. That distinction matters because all of our partners are the actual education reform groups. We're trying to give them a climate where it's easier for them to do their work." So let's see, if I am working for a an outfit like KIPP or TFA, and I don't want to proclaim my political allegiance, I can funnel money through DFER to pay off the politicians who will make the decisions that favor the benefactors and oligarchs who are funding my programs. Is this what you might call non-identity politics?? PS 160 of Co-op City, The Bronx, NY protested the dictatorial imposition of a charter school by Mayor Bloomberg & Chancellor Klein. Over 100 students, parents, residents, & teachers protested the inappropriate placement of a middle school "Equality" Charter in their elementary school. As customary with mayoral control, again the community was not consulted. This Equality Charter will encroach on the already limited space needed for their special needs students, to reduce class size and for its specialized classes. The parents are organizing against this outrage and have filed a grievance against the City. Rather than promote "Equality" [a misnomer for any charter], these privatized charters in public schools only serve to divide and generate tensions. Charters provide disparate, unequal and preferential treatment with reduced class sizes, more resources and monies. These monies should be targetted for the benefit of all public schools. Julie Woodward of ICE/UFT said, "It is government that causes public schools ‘to do poorly’ by failing to provide the necessary resources, monies, and supports! Charters and school closings are not the answer." Not surprisingly, UFT officials were absent from this important protest. The UFT can not represent its members against these charter intrusions and union-busting maneuvers of the City because the UFT has shamefully supported charters and the disastrous mayoral control of schools. GEM seeks to reverse such negative policies of the UFT/AFT which allow the private-corporate sectors to appropriate our public school dollars for their profiteering and to discredit teachers for "poorly" functioning schools. Privatization via charters only serves to undermine, underfund and union-bust our public schools. The complicity of OUR UFT must be stopped. I have heard a lot of people complain about Randi selling out the union but what's her motivation, what does she have to gain. Does it help her political career or is she just doing what every petty dictator needs to do in order to survive. Wouldn't it be easier for her to do the right thing? She may think she is doing the right thing from her point of view. Making the union a partner rather than antagonist goes way beyond Randi and if you read the Tough Liberal book you will see Shanker laid the seeds. After '68 the union had no stomach for going through confrontations. But for Randi there is the added element of personal glory as she tries to be viewed as a so-called progressive leader. Which translates into selling out. The privatizing forces and money that are against the "real" reform of public urban education are VERY strong. Randi knows this. It will take building a movement and awareness of the general public as well as teachers. Union leaders do not see themselves as movement leaders...they see themselves as "managing the members" to get the best they can for them at this point in time and also staying in power themselves. I'd also add that Randi wants it both ways: to be seen as a "progressive unionist" and as a "collaborator" (her term) with management. But something's got to give when there's that kind of contradiction. And guess which one it is? The members interests get short shrift, because "collaborating" gives her more credibility in the eyes of the Important People whom she seems need validation from. Additionally, it advances her career in ways that truly representing the interests of teachers and students would not. I don't know if you've ever heard her speak of herself as a combination of John Dewey and Samuel Gompers; she's done it more than once at the DA. The totally-off self-perception is enough to make you wince but it says a lot about how she sees herself. Sadly, the reality for teachers is far different. Thanks Bill for your question. I am sure many are grappling with that one also. -business unionists who sell its members a service. We pay them to manage us for the interests of the corporate sectors. They are the professional corporate CEO unionists who will manage us and put the militancy and grassroots struggles in deep-check. The necessary strategy of mobilizing & organizing the membership will not be done because in addition to threaten the powers that be, also threaten their bureaucratic CONTROL over their members. Instead of militancy, these bureaucrats only sell us futile strategies of lobbying and backing so-called "sympathetic" candidates in elections. - co-opters & saboteurs of grassroots democratic struggles to improve education and worker/teacher rights. - opportunistic dues-suckers (literal translation of chupa-cuotas term from Puerto Rico) which better translates with something like Dues-Vampires or Dues- Vultures. The AFT served to sabotage the progressive education struggles in Puerto Rico -- that is why the FMPR disaffiliated successfully in 2005. - ideologically see capitalism as the answer to our societal ills. As anti-socialists, they will rebait viciously whenever it suits their needs. They are in essence class-collaborationists who sell out the working class interests. Besides Great Salaries from our dues, seats at the corporate tables, great perks for their stooges and cronies, how else does the AFT/uft leadership benefit? The AFT/UFT helps to union bust and balkanize schools with their support for charters -- how will they benefit from these in the long term? Can our union & locals be tranformed from within? What is our strategy to transform our union to a defender of rank & file & community interests???? It would be good to have a workshop or forum on these important questions and what Bill raises. I am sure many of us have begun to or have studied these union characterizations and questions that apply to our AFL-CIO and other federated union formations. There should be analyses and critiques of that we can collectively study, publicize and disseminate especially to new recruits to our democratic progressive dissident wing. The Grassroots Education Movement (GEM) has been developing a broad program of where they stand on a number of issues. Racism and segregation has been put on the table for exploration. We've had some preliminary discussions about school segregation and whether integration could be a solution to the unequal schooling in this city for Blacks and Latinos. "New York State is the most segregated state for black and Latino children in America: seven out of eight black and Latino kids here go to segregated schools." "in New York City small schools are being used, intentionally or not, in ways that widen the racial divide....I predict that within ten years the entire small schools movement will collapse and be declared a failure." "we have wasted too much time in the last 20 years fiddling around with governance arrangements. The fact is that whether the school systems I visit are governed directly by the mayor independently, or through an appointed school board or an elected one, virtually all cities face the same calamity: a devastating gulf in the quality of education offered to minority kids as opposed to white kids." "The chancellor and the mayor ought to be advocating for cross-district integration with the 40 or 50 affluent suburban districts that immediately surround New York City. Admittedly, this step would take extraordinary political audacity." "it is to their [BloomKlein] credit that they have used this power to get rid of the rote and drill, stimulus-response curriculum that was being used in failing schools across the city." Nice observations. However there is little faith in Harlem that Bloomberg and Klein have any intention of strengthening anything that is public. Their actions have undermined relationships within and between communities in Harlem where I have worked in the same public school for 10 years. Their expertise is not community building or education for that matter. They are experts in privatization. Our public schools in Harlem are seeing their communities being siphoned off by the flood of charter schools that are openning right next door and more recently right inside public school buildings. Bloomberg and Klein have stated that their jobs are about providing parents with choice. If that was what education was about, we'd have great schools, but it's not and we don't have great schools under their leadership. They are however, becoming more segregated based upon need. There is a developing prejudice against high needs students. It is observable in the charter vs. public school population, where public schools shoulder a much higher percentage of English language learners, special education students and title one eligible families. This is happening while the charters receive public money in addition to the millions in private money that many charters pull in. This is a prejudice that Klein puts on public display when he removes the ELL population from his powerpoint presentation on test scores to show that the ELL students are dragging down the scores. Be does this to show that he thinks the DOE is doing a good job, that it's the ELL population that isn't. Bloomberg and Klein are now attempting to give public school space to charters at no cost even though they have the money to pay their executives salaries that are upwards from $300,000. I thought the Mayor was given control of the public schools in order to run them, not unbalance and threaten them by introducing well financed competition right inside their buildings. Martin Luther King would be crushed by what is transpiring in Harlem. Charter schools can be places of innovation and experimentation without undermining our public system, but not the way Bloomberg and Klein are running things. Many parents, educators and politicians are waking up to the fiasco of lies and the manipulation of numbers that has been Mayoral Control. I just hope it's not too late. The Bloomberg administration's educational reforms have been centered on mayoral control of the schools. This probably gives the mayor and the chancellor better tools to approach the problems in the schools, and it is to their credit that they have used this power to get rid of the rote and drill, stimulus-response curriculum that was being used in failing schools across the city. Next GEM organizing meeting: Tuesday, June 2, 5 PM. It is my great pleasure to inform you that I have just received official word that the HLA is withdrawing its request to be sited at IS 278. Assemblyman Maisel has just received the same call. I do not yet have word from DOE as to our hopes and dreams for a Performing Arts School. We will continue to press forward on that front. Nonetheless, it is truly a wonderful victory. There will be no charter school shoved down this community's throat for IS 278. I want to thank and congratulate all who stepped forward at IS 278, the PA of all our local schools, the Marine Park Civic and Greg Borruso, the Madison Marine Civic, and my colleagues in government who stood with us: Comptroller Bill Thompson, Assemblyman Alan Maisel, State Senator Marty Golden, Congressman Anthony Weiner, State Senator Carl Kruger. We should always remember that when we stand together united as neighbors, involved in our community, we can accomplish great things! Now let's see if the DOE which was offering them the 6-12 high school in 2 years takes it back. What are you betting? 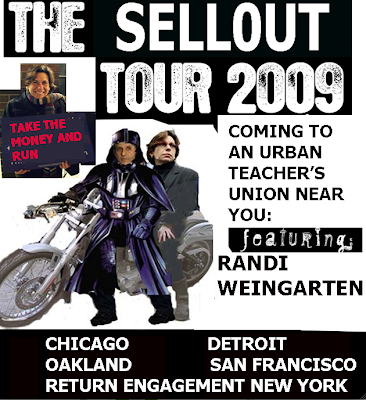 Weingarten Sells Out Detroit Teachers, following up on her work in NYC and DC. Does she dare set foot in LA? The Detroit Federation of Teachers (DFT) and the American Federation of Teachers (AFT) called a meeting of all Detroit teachers on Tuesday to prepare them for concessions in pay and benefits as part of upcoming contract negotiations. Both organizations are actively collaborating with the city government and Obama administration to implement school closings and cost-cutting. Teachers were required to gather in Detroit’s Cobo Hall, where they were addressed by union executives and school board officials before being sent to separate schools for workshops on “professional development.” The workshops are designed to prepare teachers for retrograde contract revisions, including some form of merit pay. The central theme of Randi Weingarten, president of the American Federation of Teachers, was the need for a “labor management collaboration.” Her lengthy and demagogic speech cited the success stories of individual students from Detroit in order to promote the conception that every child in the city could succeed without any fundamental improvement in funding and resources for the public schools. Weingarten made an explicit appeal for teachers to work with Democratic party politicians, including Michigan governor Jennifer Granholm and the Democratic Party. All these government officials are in fact pushing for cuts and school closures. Treasury Secretary Arne Duncan was in Detroit earlier this month to give Bobb the support of the Obama administration. A teacher responds to Angel Gonzalez' call to rally today at PS 160 in Co-op City. I will definitely be there because this is happening right in the middle of our Bronx backyard. In fact, this is happening right in the midst of the NYCDOE district in which I work, District 11. She also told me about how none of her students applied to this school and about how the students themselves were offended and not impressed by the fact that applicants were expected to send their applications to someone's apartment address instead of a P.O. Box or an actual school address. Please note that I mention the situation with my friend's students not having any desire to apply to this charter school because I want to show how wrongheaded and unprofessional this particular charter school operation is. I also wanted to highlight the fact that District 11 is and has always been a pretty successful district academically. In fact, District 11 has traditionally been the number 1 district in the Bronx in terms of standardized test scores. Thus, families in this district don't feel the need for a charter school, especially not in Co-op City since it already has gifted and talented programs that are far more rigorous and prestigious than anything that could be offered by some new, unproven, no name charter school. Why is the DOE trying to push this school on CO-OP city ? My theory is that despite the lovely private homes and the successes of District 11, there are several housing projects within this district as well as several "rough hood" sections of this district (some a mere 3-5 minutes away from the suburban Westchester county border) that the operators of this particular charter school don't want to have to handle within their school community. So,when all of that is taken into consideration, there isn't any place that they would rather be than Co-op city because Co-op city will allow this charter school to practice the ultimate skimming off the top in order to create their school's population. Bronx parents in Coop city fight charter. Rally today. Gotham Schools reported that Teach for America is sending the bulk of its recruits to charter schools next year in New York to avoid the hiring freeze. Teach For America is now sending more of its corps members to city charter schools, which are exempt from the hiring freeze. There’s another round of federal stimulus dollars that local school districts can hope for, but it may be out of reach for New York schools. That’s because the state has a law Secretary of Education Arne Duncan says could jeopardize applications for the funds: a cap on the number of charter schools educators are allowed to create. Duncan told Congress last week that, in awarding a new pot of stimulus funds meant to encourage innovation, he will give preference to states without charter school caps. He said he would also give preference to states with caps that agree to lift them. There goes the NY State Cap. And then it's Katy bar the door as the big charter school conglomerates charge in and take over swaths of NY public schools. Do you think white areas like Bayside are exempt? See one recent event in Marine Park, Brooklyn. When will NYC teachers get the message that this is part of the plan all along? To place a charter school in every public school to draw away the kids most able to make the school look good, while hiring non-union teachers. Over a period of years, they will take more and more space,while the public school and the teachers in it wither away. A charter school in a public school is like a hungry pac-man monster that will not cease until it devours the whole building. This is still a round-about way of the school-closings of the Mayor & Klein. This corporate agenda will turn our public schools into privately run franchises (& for profit over the long haul) will only be stopped if we fight back in a unified citywide fashion. If UFT educators lose the no-layoff clause in the new round of negotiations (our contract expires in Oct 09), it is possible that teachers would be terminated when schools or parts of public schools are "closed" with these charter intrusions. Teachers are thus victimized in cites like Chicago and DC when schools are "closed". I wouldn't put it past Bloomberg and Klein to do the same to us in NYC since they have been waging a consistent campaign to blame teachers for their failures to improve schools. Charter schools are privatization and are not the answer. To further fight this issue, GEM will be marching in Co-op city this Friday, May 29th @ 2:30pm to oppose the charter school being housed in PS 160. Bronx parents in Coop city fight charter. Rally this Friday. Susan Ohanian sends us this comment and link to an article written by ICE/GEM NYC teacher John Lawhead for George Schmidt's Substance. If you want to see the future of education, read this thorough, well-documented article about how corporate school reform is working from a common plan to privatize public education, create charter schools to destroy existing public schools, and undermine the 200 year tradition of free and democratic public schools in the USA. Published by Substance: http://www.substancenews.net/ and linked at Susan's site. Kudos to John for a wonderful job. This is such an important piece Ed Notes is publishing the entire thing, with the permission of Substance. Subscribe to the print edition of Substance and share it with your colleagues to support the important work they do in Chicago and nationally. "The immediate problem facing upper District 3 and students attending Harlem schools is that the [New York City Department of Education], without the input and participation of the community, is closing down our community schools and replacing them with others that serve only a narrow group of children. Students in the schools they are shutting down are being dispersed without regard for them or their families." New York public schools are facing the same 'phase out' privatization lies as Chicago's. Substance photo by John Lawhead.So declared a letter from parents, elected parent representatives and community organizations to Chancellor Joel Klein following an announcement in March that three schools, two in Harlem and one in Brooklyn would be closed and replaced by schools run by two chains of charter school operators. The move was just one part of an ongoing, wholesale closing of neighborhood schools that has become central in a battle over the direction of public education in New York City. Over the winter nearly a dozen school closings were announced by the NYC DOE. The unilateral decision making was met with a surge of protests unlike any time since mayoral control was begun in 2002. Recent protest at P.S. 72 in New York. Substance photo by John Lawhead. Not every threatened school community rallied to defend its school but many did, including M.S. 399 in Bronx, I.S./P.S. 72 in East New York, P.S. 150 in Brownsville, P.S. 144 and P.S. 241 in Harlem and Louis D. Brandeis High School on the Upper West Side of Manhattan. 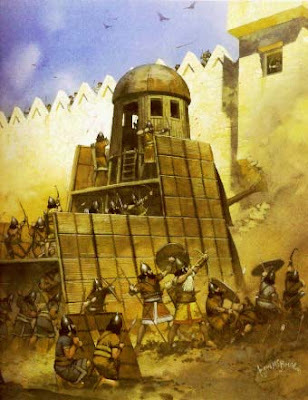 The local daily newspapers and most of the broadcast media ignored the ruckus. Participants and supporters shared video clips of rallies on Youtube and the education blogs. In late March a conference was held, entitled "Defend Public Education," by a coalition of grassroots teacher groups and several United Federation of Teachers caucuses that brought together teachers, students and parents from several of the affected schools. This event, attended by about eighty people, was the first such gathering to compare first-hand notes about the school closings, high-stakes testing for students and the long-term excessing of teachers across the city. Joel Klein and Mayor Michael Bloomberg made an effort in 2008 to raise their national profiles as "school reformers," often hitching this self-promotion to a campaign for increasing charter schools. However, the decision to directly replace zoned schools with charters at the city level was something of a provocation. It threatened to antagonize erstwhile supporters of the Mayor's "school reform" agenda and unsettle some key alliances in a year when the legal framework for mayoral control is being reconsidered by the New York state legislature. A lawsuit was filed to stop the plan by the UFT and the New York Civil Liberties Union. The suit claimed that the changes required approval by the local Community Education Councils (weak successors to local community school boards). “Zoning laws are the one small area of oversight that parents were allowed to keep under mayoral control," declared Executive Director Donna Lieberman in an NYCLU press release. The DOE quickly reversed itself and said that the schools could remain open but would share space with the charters. Klein wrote letters to parents in the schools previously targeted for phase-out, stating as much and urging them to transfer their children immediately, naming adjacent zoned schools and pointedly giving them both names and contact information for area charter schools to apply to. Brooklyn students protest privatization of public schools. Substance photo by John Lawhead. This shrinking of neighborhood schools and forcing them to share space with new charters is a familiar arrangement for the poor and largely African-American areas of the city where the charters have proliferated. The more than eighty charter schools in New York City are nearly all confined to the Bronx, Harlem and north Brooklyn. Although the charter operators receive millions in corporate and foundation largesse, they are given space by the city without cost to them. As the website of the Harlem Success Academy gloats: "We could raise millions and build a gorgeous new facility with all of the bells and whistles... [but] we take a different approach..."
The tens of millions received from private sources that are not used for bells, whistles or new buildings allow the schools to cap class sizes at levels well below that of the city's neighborhood schools, some as low as 18 students, and offer arts, music and technology programs not seen in zoned schools. It also goes to pay salaries like the $371,000 collected by Eva Moskowitz in 2007. Moskowitz is a former member of the New York City Council who is now the CEO of the Harlem Success Academies. Teachers at Harlem Success work longer hours and like all but a handful across the city are without union representation. They typically quit in droves at the end of the year and have to be replaced. One quarter of the teachers in Moskowitz's first academy were gone in a year. Reliance upon the patronage of Bloomberg and Klein (whose city education department is commonly called "Tweed" in reference to its headquarters which are housed in a restored landmark building, the old New York County Courthouse, built by William M. "Boss" Tweed at phenomenal expense, bloated by embezzlement, during the 1860s and 1870s) goes well beyond sharing space. Figures in the campaign for charter school expansion have played key roles in helping to set up political organizations to promote Klein's "reform" agenda and mayoral control. For instance, a recently disclosed donation of $500,000 from former schools Chancellor Harold Levy's hedge-fund management firm to Al Sharpton's organization, the National Action Network, was channeled by way of Democrats for Education Reform, a national advocacy group for charters. The money went to Sharpton as he was beginning a propaganda tour with Klein much of which involved the promotion of charters. Klein often presides at lotteries for places in charter schools which have become media events with Klein extolling the parents' desire for "choice" and their apparent satisfaction with the inherent genius of free enterprise unfettered by regulation. The so-called "choice" the parents seek is never perceived as a flight from Klein's own mismanagement, overregulation, narrow curriculum choices or oversized classes. The favor and admiration was recently reciprocated as contingents of placard-waving charter school parents appeared at the New York State Assembly Education Committee hearings on mayoral control held in each of the city's five boroughs from January to March. Juan Gonzalez, a columnist for the Daily News called them the mayor's "shock troops." In Brooklyn they carried signs that read "mayoral control = better schools." Parents, teachers, students and community leaders have joined the New York protests. Substance photo by John Lawhead. More than a hundred had rallied in the morning but by the afternoon the group had thinned out. Gonzalez also reported that "disgruntled charter school parents" told him their principals require them to attend." The show of support might perhaps constitute the groundswell that never materialized for the actual "school reform" initiatives Tweed has planned, implemented and abandoned in favor of new initiatives. For Bloomberg's mayoral control, installed by the legislature and operating in the absence of any direct popular mandate it is no small matter that his regime enjoy some semblance of public enthusiasm. The mayoral-control experiment of the last seven years was shaped at the outset by lessons learned from Edison takeover fiasco of 2001. It no doubt influenced Bloomberg's demand for mayor control and his continuing demand that his power not be divided in any way. It also played a role in his successfully courting and enjoying the support of groups who opposed the Edison takeover plan, including ACORN and the UFT. In 2001 Chancellor Harold O. Levy announced a plan for Edison Schools Inc. to take over the management of five public schools. He selected the schools from the state's SURR list. The regular SURR process (Schools Under Registration Review) included the now-all-but-forgotten concept that the closing of schools should be carried out as a last resort. The state provided schools on the SURR list with increased resources, three years of intensive monitoring and clearly defined goals that would allow the schools to get off the list. Levy’s plan was to jump the gun and put the schools under private management more quickly by way of getting majority approval from parents, if not the much hoped-for groundswell. At first Edison Schools was entrusted with publicizing the plan. Students were promised computers to take home and the New York daily press joined in with a chorus of approval. However, in response to a lawsuit ACORN and other communities organizations were allowed to distribute less-than-flattering fact sheets about Edison to families involved in the decision. Mail-in ballots were required. After hearing both sides the parents defeated the plan by a four-to-one margin. If Albany lawmakers do nothing by June of this year the legislation providing for the grander business experiment that it began in 2002 will expire. Most elected officials have staked out a “mend it, not end it" position toward mayor control, denouncing much of the mayor's actual record but holding fast to the concept of centralized authority and the "school reform" agenda. The hearings involved long summaries of an institution brought out of control by a lack of democracy though not always in those words. Speakers denounced the lack of “voice” or "consultation" by parents and their representatives, the privatizing of public policy, the lack of transparency, the extravagant spending on testing and review systems, no-bid contracts, cost overruns, the squandering of money directed by the state to lower class sizes, and the failure of Tweed to follow state education laws. The proposals to "mend" mayoral control with a new law face a disturbing challenge in Tweed's tendency to scoff at laws. For parents and rank-and-file educators who have been focused on school-level educational issues there is frustration with the plans to reform the "reformers," many of which seemed intended merely to widen the circle of those participating in the deal making and preclude direct democracy of the sort that led to the rejection of the Edison plan in 2001. Few would disagree that the teachers' union has become less powerful in recent years. It might be attributed both to a preference for closed-doors deal making as well as being politically outmaneuved by Bloomberg. It also stems from Weingarten's tendency to use the same reform rhetoric spouted by Klein and Bloomberg. Raises for teachers' were a "reform" designed to draw better teachers into the schools. A bargaining agreement in 2005, dubbed a "school reform" contract by the factfinders brought dramatic concessions from the teachers' union, adding time to the school day and taking away transfer rights, school decision making, and the right to grieve letters to file. Tweed also unilaterally changed school financing so that school would be penalized for hiring teachers with higher salaries. With the loss of seniority rights, Klein by closing schools has created a surplus of teachers, called Absent Teacher Reserve teachers or ATRs whose numbers have reach some 1700. Many of these teachers have been in excess for several years. Despite an agreement at the end of 2008 to subsidize schools who hired teachers in excess, only a handful have got positions in the months since while Tweed has continued to recruit and hire hundreds of new teachers. On the march in New York City. Substance photo by John Lawhead. The weakening of the position of teachers in the schools had the effect of giving principals more power and diminished collective planning and decision making. Tweed's emphasis on principals as the "instructional leaders" of the school has made them virtually exempt from previous constraints, including the state law requiring consensus and a real role for school leadership teams. Klein who loves the relatively tiny portion of educating done by charter schools has only infinite disdain for any "gradualism" when it comes to changing the "status quo" of the school in his charge. He is the shock therapist with the incomprehensible priorities: bewildering, breakneck administrative reorganizations, an erratic school grading system, new schemes for bonuses, threats and all manner of school improvement by remote control, the condemnation and abandonment of what he controls, and the school closings. He never shows any interest in what has worked so far and what hasn't, which leads some observers to see a modern-day Lord of Misrule in the proceedings, perhaps something worthy of what the former GE chief and management guru Jack Welch called "creative destruction." Leonie Haimson, a parent and school advocate, writing on the New York City Public School Parents blog, wrote that the Tweed strategy seemed like an effort to "create such incompetent, dysfunctional government that the public will no longer support the notion that the government can provide useful public services, leading to further privatization and the undermining of the whole notion of the public good." Teachers who never wanted to be part of any lousy schools wonder, who wins from the closings and reorganizations? Concerned about "failing" schools? Poverty schools are like the overmedicated patient that eventually needs a different pill for every function. How will the dizzy, disordered, hysterical, somnolent, depressed school ever get "fixed" when it is such a lucrative prospect for the education companies? Profits are predicated on students and teachers' lack of control over the institutions where they work and learn. How many of the products, the packaged teacher-proof lessons, the training and consulting, interim assessments would be exposed as unnecessary if school communities could find a way to use their own judgment and solve their own problems? The activists who organized the "Defend Public Education" conference in March have formed a much broader group called the Grassroots Education Movement that is seeking to work with parent and educator groups throughout the city. On May 5 a forum was held to discuss the charter school conundrum and was well was attended by parents and educators. Mike Fiorillo of the Independent Community of Educators (ICE) described a "corporate-philanthropic-academic complex" that was using civil rights rhetoric to undermine public control of public institutions. Cecilia Blewer of the Independent Commission on Public Education said the word choice is something to be suspicious of. "Some choices cannibalize others." In the discussion a parent of two children in charter schools discussed an administration's opposition to her forming a parents' association. A teacher from a "conversion" charter presented a rebuttal to some of the claims that charters exclude students with special needs. Someone else distributed a handout that illustrated as much in a set of graphs. A parent representative from Queens discussed how the folks attending could get beyond preaching to the choir. There was debate about whether the campaign for scaling up charter schools had hijacked what had once been a grassroots effort or whether charters had racist roots in segregationism. Many agreed that the threat of privatization required redefining the purpose of education. Another speaker Akinlabi Mackall, of Black New Yorkers for Educational Excellence spoke about "the unglamorous day to day work" of building a movement to create something different. This article was originally published in the print edition of Substance, May 2009. Copyright 2009 Substance, Inc. Reprint permissions are hereby granted to not-for-profit and pro public education groups and for teaching purposes. Please give full credit to Substance, www.substancenews.net. Your subscription to Substance helps provide timely and accurate news about the fight to save public education in the face of corporate media lies. Here is the column I just wrote for The Wave, Rockaway's community newpaper, for this Friday's edition. On Tuesday, May 26, 2009, the Marine Park Community mobilized massive numbers of people to an overflowing auditorium to protest at the Department of Education Public Hearing at IS 278 over the upcoming placement of the Hebrew Language Academy (HLA) charter school, funded and founded by the billionaire Michael Steinhardt (the Steinhardt Conservatory at Brooklyn Botanical Garden) in the building. His daughter Sara Berman is spearheading the school and spoke at the meeting. The Steinhardts should have stuck to gardening. The back story is that when HLA received approval there was an absolute promise that they would find their own space. They looked and looked – they say- but couldn’t find a suitable location. One minute they were looking for 25,000 square feet of space and the next it was 50,000. One parent said he found loads of locations in about 10 minutes on the web and asked how they couldn’t find a space in two years. There was just a bit of suspicion that there was never any intention of finding a space, for which HLA would have to either buy or pay a lot of rent. Space in public schools is free for charters. A no-brainer. IS 278 with great facilities and right in Marine Park – the target all along. Few believed that HLA would only be there for the promised two years while they looked for a space. There is a tendency to demand more and more space as grades are added. Witness Eva Moskowitz’ Harlem Success Schools attempts to take over as many public school buildings as they can. The charter lottery was held in a YMHA on a Sunday afternoon and many in the community claimed it was not advertised widely. HLA claimed they sent out many notices. Three hundred people applied for 150 positions. HLA reps claimed there was diversity, but brought no numbers to back it up. Sara Berman raved about how there would be two teachers in a room. And low class sizes. Wow! No wonder parents, even in Marine Park where schools generally do pretty well, are tempted. But that is a part of the divisiveness of charter school, which ultimately undermine neighborhood schools. I bet no parent at IS 278 ever saw two teachers in a room. Or real low class sizes. The Hispanic speaking principal chosen to head HLA, who speaks no Hebrew, spoke. Would you be surprised if she is a temporary figurehead who at some point in the next year will leave to spend more time with her family? Politicians can’t resist a crowd. Anthony Weiner, Bill Thompson, State Senator Marty Goldman, local Councilman Lew Fiddler and reps of other politicians showed up to make statements “supporting” the community. Hypocrites all. The problem is putting the schools in control of the mayor and almost every one of them still supports mayoral control of the schools. Brooklyn State Senator Karl Kruger, whose rep, wearing a yarmulke no less, spoke out against placing HLA (http://hlacharterschool.org/) in IS 278 made a strong statement challenging Bloomberg’s control over the schools. Kruger, a conservative Democrat, “ vehemently opposes Senate Majority leader Malcolm Smith’s support for mayoral control” according to the Gotham Schools blog. “Kruger’s proposal eliminates the position of schools chancellor and replaces it with a commissioner of education, who the mayor would select from a list of three candidates nominated by the Panel for Educational Policy board.” Good start Carl, but the power to control education should be totally removed from the hands of politicians. That’s why the IS 278 community is in the pickle it’s in. As one would expect, the UFT was absent. I heard people asking why and I told them the UFT couldn’t help you protest the placing of a charter school in your middle school since they had done exactly the same thing with their charter middle school in East NY at IS 166 - George Gershwin (my Alma Mata). I urged teachers to put pressure on the union. Most speakers, while opposing placing the charter in IS 278, said they supported HLA and wished them well in finding other space. Educational historian Diane Ravitch's disagrees. She wrote an oped in the Daily News in January: He [Steinhardt] is asking taxpayers to support an institution that has obvious religious overtones. In a city with a great variety of Jewish schools and other agencies that encourage Jewish identity, it makes no sense to create a public school with the same purpose. If the goal of the Hebrew Language Charter School is to strengthen the religious identity of Russian and Israeli Jews, then it should be a private school. If the goal is to teach Hebrew to a broad variety of students, then the Regents should encourage the teaching of Hebrew in the regular public schools. If the IS 278 community succeeds in keeping HLA out and the DOE shoves HLA into another public school with a less activist, the IS 278 community doesn’t seem to think there would be anything wrong with that. I spoke at the meeting representing the Grassroots Education Movement (GEM). I told them they were not alone, as the DOE is attacking its own public schools (don’t they run them) and favoring charters. I said I was against the very idea of charter schools that funnel public money into the hands of private interests. The much trumpeted “school choice” is juts a marketing concept to undermine neighborhood schools and privatize them. I spoke directly to the few HLA supporters sitting in the front row with big white “I Support HLA” buttons. Michael Steinhardt lost millions in the Bernie Madoff scheme. He seems to have come up with a nice one of his own. Learning from the master. GEM was there with signs and a GEM leaflet and two of us spoke. I have some poor quality video and I will try to put up some segments in a day or two. I'll grab a few stills off the video later and add them to this post. As one would expect, the UFT was absent. I heard people asking why and I told them the UFT can't help you protest the placing of a charter school in your middle school since they had done exactly the same thing with their charter middle school in East NY at IS 166 - George Gershwin MS - (my alma mata). I urged teachers to put pressure on the union for support. But worse of all, it became really apparent the contempt that the DOE holds the parents and students of New York City. Last night at a town hall meeting held by Sen. Marty Golden where this issue was raised at a packed house and the opposition of everyone there was apparent, Mr. John White of the DOE stated that the 150 children scheduled to be in the charter school are the "jewels" of the DOE. I guess that means that the 1100 children currently attending IS 278 as well as the numbers of students that would attend this school in the future are just dross to the DOE. They are throwaways. Why care what happens to them, their education, their class sizes, and the programs that help them or the quality of their school day -- all of which will be sacrificed because of the forced entry of this charter school? Why care what happens to a neighborhood school that has worked for years to improve the success of their children? They don't matter because to the Mayor and the DOE they are not the "jewels". For more on the Hebrew Language Charter school, which has announced an intention to take space inside IS 278, a Title One school in Brooklyn, see this Daily news article and Diane Ravitch's oped here. I just got an e-mail from our Chapter Leader alerting us that Mayor Bloomberg's funded lobbying group, Learn NY, is lurking outside the schools asking teachers to sign a petition supporting mayoral control. Even worse, they are saying that this is the UFT's position, so they're telling teachers it's ok to sign the petition. This is outrageous. If we see these guys hanging around, we need to let the union know right away. And let the Mayor's petition people know what we think about Bloomberg's corporatizers and charterizers. Ask 'em how much they're getting paid to gather signatures. Closing schools, hundreds of ATRs, high-stakes testing, Principal's Academy clones who haven't spent a nano-second in the classroom -- this is the mayor's agenda. But the fact of the matter is that starting in 2002 the union supported Bloomberg's power grab for control of the schools. Even today it says "the UFT's support for mayoral control was instrumental of the passage of the law" (from UFT School Governance Task Force report, February 2009). And despite its talk of "checks and balances," the UFT's proposal says explicitly that "the mayor should retain control of the school system" by selecting the chancellor, appointing five members of an education policy council, and control of the budget. The UFT's "modifications" are for a couple more members to the education council appointed by the city council types, and a couple less appointed by the mayor. As if that would fundamentally change anything. As for the P.E.P.--the Panel for Educational Policy, it has well earned it's nickname of "Panel for Educational Puppets." The whole push for mayoral control is part of the drive for corporatization of public education. And as Deborah Meier, the founder of the small schools' movement, noted, even the recent New York State tests which Bloomberg and Klein touted, show that school districts with mayoral control did worse than those without it. When the vote on the UFT's position came up at February's special delegate assembly, many delegates were deeply concerned about any form of mayoral control. Many wanted the vote put off until they could bring it back to their chapter members for discussion. People had at most a couple days to look at the UFT report. But the vote was rammed through. So, it's no wonder Bloomberg's hacks and flacks are trying to capitalize on the glaring ambiguity in the UFT's position. Personally, I don't think we need the mayor, or any of the suits telling us what to do. As many people have pointed out, mayoral control is inherently dictatorial. The schools should be democratically run by teachers, parents, students, and school workers working together in the best interest of the kids. When this humble teacher advised that the global economy was over a few months ago it was greeted with mild amusement by most I'm sure, if it registered at all. After all who am I? The end of the global economy was, of course, not my original idea. It belongs to the "peak oil" pioneers. People who saw that the planet's supply of oil would peak and then decline. And that an economy built on a fantasy, that oil would serve as a perpetual and cheap source of energy, would fail. Why discuss this matter on a site that seeks to defend the principle of universal public education across the US? Because this transition will have a profound effect on public education and what's left of American democracy. 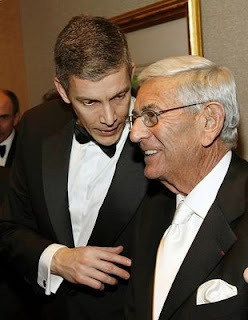 For instance the biggest threats to public education in the age of globalization, the Business Roundtable, Bill Gates, Eli Broad, the wife and spawn of Sam Walton, and Mayor "Little Ceasar" Bloomberg are going to go into decline. The Green Dot's, the KIPP, the TFA's, and Eva Moskowitz' Harlem crusade are soon over. The $18 billion Gates lost this year is just the first measure of his fall. He's gonna live like us soon! Of course I exaggerate, Gates would fake his own death before he'd work for a living. But the point is a realigned capitalist economy will deal these folks out. The US economy is going to be run out of the banks, out of Goldman Sachs' offices. That's why the US treasury is being transferred there now. And the social order, if it can be maintained behind massive joblessness and the end of pensions and health care, will be the responsibility of the military. The public schools face a new existential threat, fascism, the last refuge of capitalism from an economic system that actually works for humanity. There are three current articles that take BloomKlein to the woodshed on a number of issues. 1. The NY Times piece (Principals Younger and Freer, but Raise Doubts in the Schools) on how hard it is to be a principal and how young and inexperienced so many are, insists on judging schools based on the DOE's own flawed report card system. The article does make the point that evcn in this report card one grade system, which I believe has been at times tainted by political considerations, Leadership Academy principals do not fare as well as more traditional principals with more teaching experience. I want to comment in the future on this issue based on my sense that putting absolute power in anyone's hands - a mayor, a union president, a principal, a teacher – does not result in the best system and often results in disaster. Bloomberg had fashioned a city of cranes and baby strollers, but only the cranes fell into his field of sight. Wayne Barrett, who I often disagree with, does a number on the n0-bids. It seems that from the very first days of the Bush/Cheney administration, when they steadfastly refused to release the names and affiliations of the crony capitalists who attended the VP's so-called energy policy forum, the new rule in executive government is to spit in the face of all who are charged with oversight. Thus, Bush and Cheney routinely ignored Congressional requests for information and/or refused to answer subpoenas, even in cases where the laws specifically ordered that they must do so. They were equally dismissive of the General Accounting Office and every other federal agency, and even the courts, rendering moot and impotent the entire concept of checks and balances on which this country was built. Now, as Wayne Barrett's Village Voice article demonstrates, we see yet again from Bloomberg and Klein the same haughty dismissiveness of anyone who dares look over their shoulder, even when doing so is not only their right but their reason for existence. Bloomberg/Klein repeatedly demonstrate the same contempt for the checks and balances that arise from independent oversight that we saw from Bush/Cheney/Rumsfeld/Rove and their ilk. One can hardly help but conclude that the Mayor and Chancellor have wholeheartedly adopted the strategies they witnessed from the previous presidential administration, having effectively learned at the feet of the masters. Of course, the fact that this behavior is wholly antithetical to the very notion of democratic government as defined by our Founding Fathers is irrelevant; it's all about poiwer and control now, not good government or concern for the citizenry. It also shows that, at least in the case of NYC, the State Legislature needs not only to amend mayoral control of schools (which has become the prime example for unaccountability -- just read Mr. Barrett's outrageously unbelievable closing sentence from Joel Klein, claiming that no-bid contracting is an "urban myth"!! ), it needs to put some serious teeth (i.e., enforceable sanctions) into these oversight agencies. I have no problem seeing a schools chancellor or mayor or city controller sitting in jail for refusing to provide information or answer questions -- checks and balances are far more valuable than those individuals' freedom to ignore legitimate requests made in the public interest. Without them, we have government of, by, and for the rich and corporate, unanswerable to anyone, operating behind closed doors, and implementing policy by diktat. This is what Mr. Bloomberg wants us to buy into, another four years (or more, if he decides to purchase a few more elections) of authoritarian government by contempt? Is this the government NYC needs? That the people want? That our schools need? What it heaven's name does its very behavior teach our children except that money and power makes and follows its own rules? Where's the civics lesson in that? Dennis Tompkins, the spokesman for DiNapoli, says that the auditors requested the contract database on January 17, 2008, and got it piecemeal in March and May, but didn't get the entire database until November. When DiNapoli sent the department a final draft of the audit on March 6, 2009, seeking a response in 30 days, the department didn't comply and requested a 15-day extension. Finally, on April 27, says Tompkins, the auditors met with DOE and said DiNapoli was going to publish the audit without DOE response. The next day, DOE submitted a detailed, four-page reply that it had obviously been sitting on. DOE appeared to be trying to delay the release of the audit until legislative leaders had settled on a package of bills to renew mayoral control. In the audit, the State Comptroller made numerous recommendations for improved performance and implementation on the part of the city. Nevertheless, in their official response, DOE’s Kathleen Grimm refused to adopt any of these suggestions, claiming that their compliance was sufficient. The date she sent the DOE’s official response, without which the Comptroller would not release the audit? The response was dated November 7, 2006– the day of the last mayoral election. And they say that Mayoral control has de-politicized the schools? Puh-leaze. Note: The journalism students Barrett mentions who tried to pry information on the no-bids from Tweed and were stalled and stone-walled, used Ed Notes and other blogs to advertise their quest. No Bid Tip Sheet Public Eyes on Public Schools). Welcome to our experiment in open-source investigative journalism. We are a team of three students at the Columbia Graduate School of Journalism reporting on sole-source contracts awarded by the New York City Department of Education. Lurking in the background is the fear that the Teacher Data Reports will be used to evaluate teachers. “Absolutely not,” is the steady refrain from Chancellor Joel Klein. “The Teacher Data Reports are not to be used for evaluation purposes. That is, they won’t be used in tenure determinations or the annual rating process,” wrote Chancellor Klein and UFT President Randi Weingarten, in a joint letter last October. I think that this is the primary purpose of the Teacher Data Reports, but they are being cloaked in rhetoric that describes them as a professional development tool. Given the role Randi Weingarten plays in this drama, at what point do classroom teachers declare her bogus role as a union leader null and void? On Thursday, May 22, I went to the ATR meeting. Michael Mendel explained about what the hiring freeze means for the ATRs. Randi came for some minutes and talked about it also. She pretended to be a martyr. She stated how hard has it been to reach this agreement in NY when in some other states people were losing jobs. At that point, I wanted to stand up and tell her that it was her fault that caused this mess. She is the one who gave up seniority rights. During this meeting many ATRS applauded RW and Mendel. I couldn't believe this! I wonder if this hiring freeze will be implemented. In the district I teach in most all the principals are crooks. They think they are attached to the buildings they run. They hide the jobs and give them to their friends. Added comments from Leonie Haimson in response to the apple polishing Mark Sternberg, principal of the Bronx Lab School. Leonie is too nice. The reporter she refers to (How did the reporter miss this?) is David Herzenhorn who missed a lot accidentally on purpose when he covered the NYC ed beat. He is now covering the political beat in DC and co-wrote a front page article in today's Times. I wonder what he missed today? If you look at the piece I posted below this one where Bloomberg trashes parent attempt to play more of a role with his "joke" of claiming "educators should be in charge" when in fact his non-educator chancellor has made teacher input minimal, here is one educator who doesn't buy into mayoral control, which unfortunately his union leadership does. In today's New York Daily News, Arthur Goldstein, an ESL teacher at Francis Lewis HS in Bayside, takes a stand. Nice to see a teacher publicly speak out. As a teacher in an A-rated school, I believe mayoral control has been an absolute disaster. Absolute power corrupts absolutely. Our federal and state governments have checks and balances so no one person has total control, which is a synonym for dictatorship. City kids need reasonable class sizes and decent facilities. Under Mayor Bloomberg, class sizes just took their biggest leap in 10 years. Some people say class size doesn't matter, but even the best teachers can give more attention to 20 kids than 34. The fewer kids I have, the more individual attention each one gets. Under this mayor, charter schools get the best of everything, including small classes and new technology. My high school was built to hold 1,800 but enrolls 4,450 students. My kids sit in a crumbling trailer, with no technology and often no heat in the winter. So much for efficiency. The mayor says it's his way or "the bad old days." That's a false choice. We need a system that works better than what we have. We need a chancellor who works for the kids, not the mayor. The chancellor needs to fight for what's best for kids whether or not the mayor agrees. He can't do that if the mayor can fire him for not following his orders. A few years ago, the mayor fired two members of the Panel for Educational Policy who had the nerve to disagree with him. Consequently, the PEP is a mayoral rubber stamp. No mayoral appointee dares to stand up for kids. This mayor boasts about accountability. Teachers are accountable. Principals are accountable, but the only time the mayor is accountable is once every four years. That's not enough, particularly for a man who is prepared to spend $100 million to buy reelection and who scoffed at the voters by changing the term limits law they twice affirmed. Four more years of this system guarantees the privatization and destruction of public education in New York City. That's a prospect we should all oppose. The headline for his oped is “Accountability saved my dying school” but the truth is very different. DOE allowed Evander Childs to die, and instead opened new schools w/ completely different types of students w/in them. As Eduwonkette noted in 2007: “On every dimension, the Evander incoming 9th graders are lagging behind academically - they are more likely to be in special education or to be classified as ELL, they are much more likely to be overage for their grade (i.e. they had been retained before), their attendance rates in junior high school were much lower, and they were much less likely to be proficient in reading and math. Of particular note is the praise showered on Bronx Lab at the end of the 2004-2005 school year - see this NY Times article - but 46.6% of their kids were proficient in reading and 52.7% in math when they walked in the door, while Evander's entering students passed at rates of only 11.1% in reading and 12.8% in math. What else? Oh yes, according to the DOE’s statistics, Bronx Lab has class sizes this year ranging from 13 to 25. Meanwhile, most of our large high schools – including the one that Arthur Goldstein teaches at – continue to have class sizes of 34, and the DOE refuses to do anything about it. In fact Joel Klein recently said if he had his way, he would shrink the teaching force by 30% -- which would consign many of our regular public high schools to class sizes of 45 students.